Stanbridge College encourages you and your loved ones to step up for autism awareness and walk in the 2012 Orange County Walk Now for Autism Speaks on Saturday, October 13, 2012. Autism is the fastest-growing serious developmental disorder in the U.S. Every 11 minutes, another family receives the devastating news that their child has an autism spectrum disorder. Join Autism Speaks to help give these families hope. Register: CLICK HERE to register for this walk! Support a Stanbridge College Student Walker! 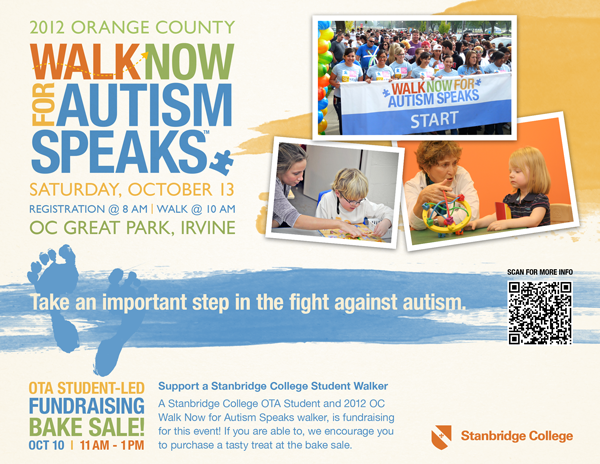 Erika Agustin, Stanbridge College OTA Student and 2012 OC Walk Now for Autism Speaks walker is fundraising for this event! If you are able to, we encourage you to purchase a tasty treat from her Bake Sale on Wednesday, October 10, 2012 from 11:00 a.m. to 1:00 p.m. All donations will go to sponsoring Ericka at this event! To learn more about the 2012 Orange County Walk Now for Autism Speaks, please click here or email orangecounty@austismspeaks.org. One step can move mountains. Move forward for your Orange County community today.